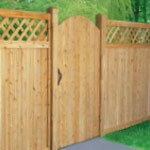 The gate is the focus of your new fence and should be chosen with care. While NMI can manufacture your gate to match any panel, choosing a gate that harmonizes rather than matches the fence style, allows the gate to stand out as the focal point. Another example would be, using a larger gate post, and/or adding an arbor to make your entranceway more attractive.